Wonder why I didn't knew about Preload before. Install Preload and you will see a visible change in the application loading time for good. Preload is nice little application that could make your linux system a lot more snappier. Preload is an adaptive readahead daemon. It monitors applications that users run, and by analyzing this data, predicts what applications users might run, and fetches those binaries and their dependencies into memory for faster startup times. Preload packages are available for almost all linux distributions. 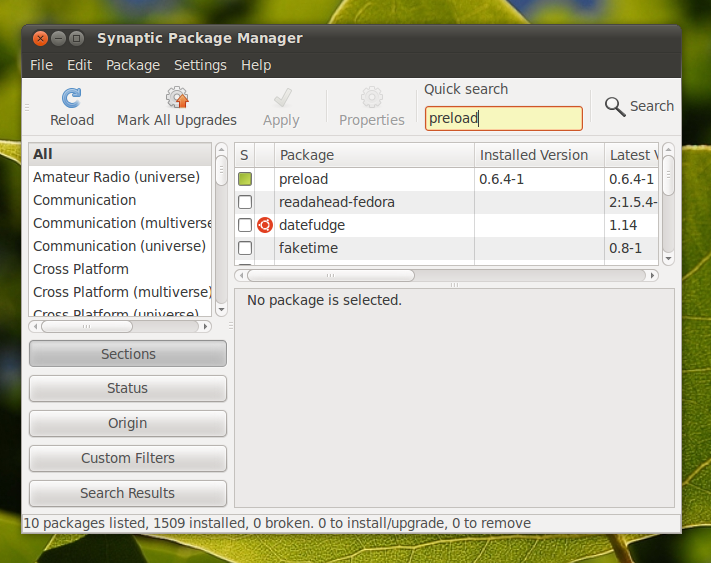 And it is available by default in the Synaptic Package Manager in Ubuntu. Alternatively, you can install it via Terminal. Thats it. Preload will run silently in the background. If you want to further tweak Preload, conf file is available at /etc/preload.conf. Try it and let me know if it actually works for you.